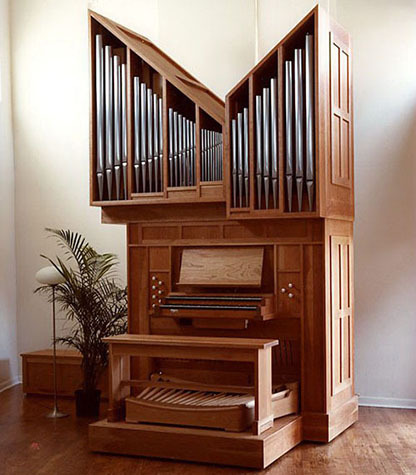 This organ is located in the sanctuary of Christ United Methodist Church in Plano, Texas, and is an instrument with a broad capability for a variety of organ literature, yet priced affordably. Learn more about this spectacular organ! 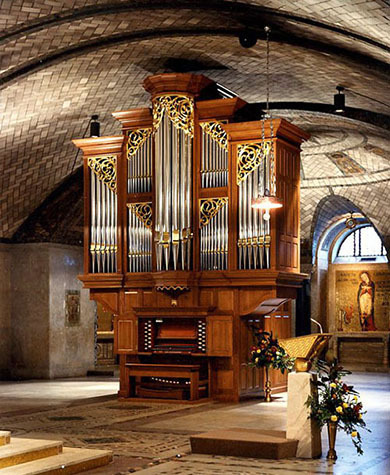 Below are a few examples of the high quality instruments created by the Schudi Organ Company. Click on the photos to view the organs in a larger size. St. Vincent de Paul Chapel, The Catholic University of America, Washington, D.C. is the home for this Schudi organ, Opus 18. It was the featured cover photograph for The American Organist magazine, February of 1982. Click your mouse on this image to view larger photos. 3 Manual, MKA, ESA, 23 stops, 1981. 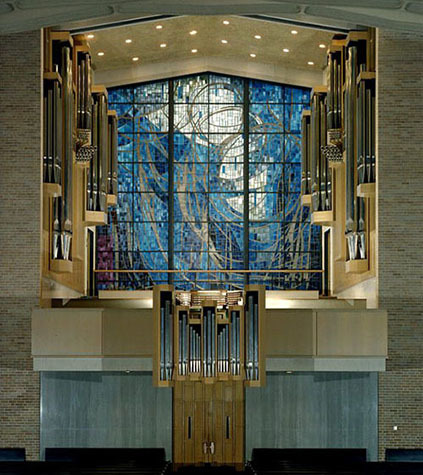 St. Thomas Aquinas Catholic Church in Dallas is home to Schudi organ, Opus 6. Since 1978 this instrument has gained international acclaim for its commanding sounds. Michael Lindner heads the music program of the church today, succeeding the fondly remembered Paul Riedo. Click your mouse on the small photo for more photos and on "Music" for a listing of recordings available. 3 Manual, ESC, 38 stops. This Schudi organ, Opus 17, is located in the Central Christian Church in Texarkana, Texas. It was constructed and installed in 1980. It has the distinction of being the first tracker organ to bear the Schudi nameplate. 2 Manual, MKA, ESA, 13 stops. 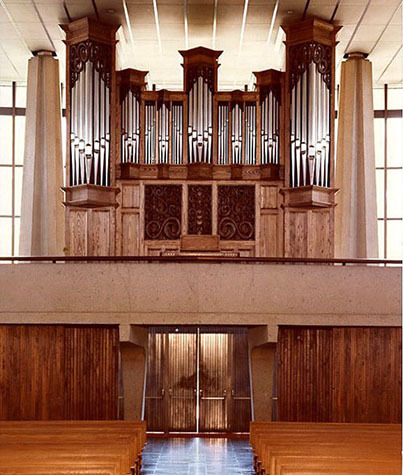 St. Andrew's Episcopal Church of Ft. Worth, Texas owns this Schudi organ, Opus 35, for use in its Schuman chapel. 1 Manual, MKA, MSA, 5 stops. Additionally, Schudi constructed a second instrument soon after for the larger worship area, Opus 34. 3 Manual, MSA, ESA, 30 stops. Click on you mouse to tour both of these instruments further. Denton, Texas is where you'll find Schudi organ, Opus 27. 2 Manual, MKA, MSA, 17 stops. This is located in the gallery of the First Presbyterian Church. It incorporated several stops from a pervious organ. The current instrument was installed in 1984. 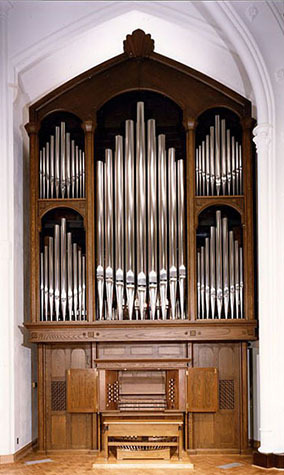 St. Michael and All Angels Episcopal Church in Dallas, Texas is the locale for this massive instrument constructed in 1985. 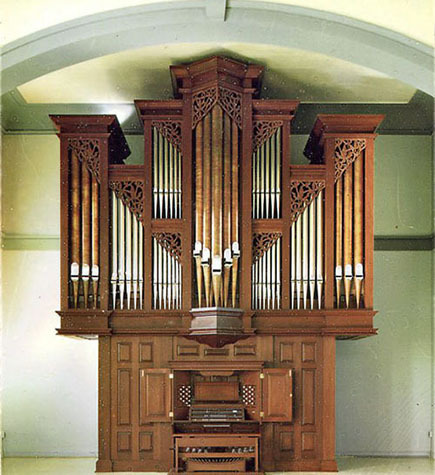 It is the largest instrument built by the Schudi firm and was featured on the cover of The American Organist magazine, August, 1995. Opus 30, it's the key supportive instrument for the musical program headed by Dr. Paul Lindsay Thomas. A recent recording of Dr. Thomas' compositions is featured under "Music". Click on photo to tour the instrument in its entirety. 4 Manual, ESC, 78 stops. A major renovation of the sanctuary area was done prior to the installation of this Schudi organ, Opus 33 in 1986. It dramatically enhances the First Presbyterian Church of Lubbock, Texas. 2 Manual, MKA, ESA, 23 stops. The Oklahoma congregation of the First Christian Church in Norman owns this Schudi organ, Opus 32. 2 Manual, MKA, ESA, 22 stops, installed in 1986. Christ Church of Hamilton and Wenham is the home for this organ, Opus 37, 1986. 2 Manual, MKA, ESA, 14 stops. This home installation, Opus 28, is owned by Dr. Larry Palmer, professor of harpsichord and organ; Meadows School of the Arts, Southern Methodist University. The instrument is housed in a solid Cherry wood case and has 2 Manuals, MKA, MSA with 7 stops. 1984. Dr. Palmer is available for recitals, lectures, and master classes. 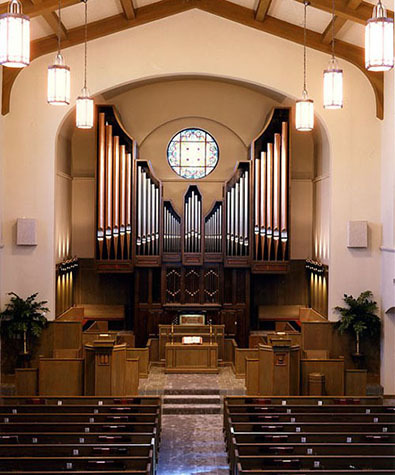 Walnut Hill United Methodist Church in Dallas, Texas is where you will find Schudi organ, Opus 20. 3 Manual, MKA, ESA, 24 stops, 1984. The instrument is housed in a solid Honduras mahogany case which is 33 ft. tall. Corpus Christi Church of Pacific Palisades, California, is the location for this instrument, Opus 23. 2 Manual, MKA, ESA, 20 stops, 1984. Included with the feature is a look inside the Swell box and a close up photo of the hand-carved screens which adorn the case. Click on your mouse to view this in detail. Parkway Presbyterian Church in Corpus Christi, Texas has Schudi organ, Opus 25. 2 Manual, MKA, MSA, 17 stops, 1984. Click on small photo to view a larger one. 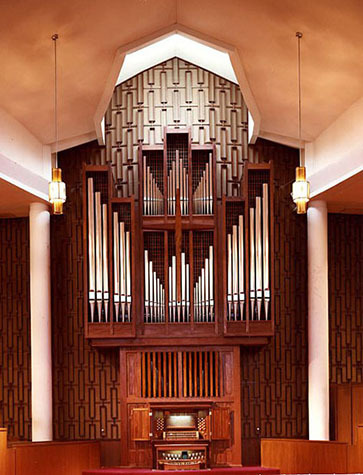 Richardson, Texas, just North of Dallas, is the home of this organ which is located in the gallery of St. Luke's Lutheran Church. 2 Manual, MKA, MSA, 17 stops, 1982. This Schudi organ, Opus 38, is located in the Crypt Chapel of the Basilica of the Shrine of the Immaculate Conception, Washington, D.C. The classically designed and executed wood carvings are elegantly enhanced with gold leaf. The organ's stop action is unique in that it possess both mechanical and electric activation. It was the cover feature for The American Organist June, 1989. St. Mark's Episcopal Church in Durango, Colorado incorporated this new organ as part of a massive renovation of their building. The organ is Opus 41 for the Schudi firm and was installed in 1992. 2 Manual, MKA, MSA, 19 stops. Click on small photo to view additional shots of the organ.